Stress, hormonal changes, over-styling, poor nutrition, heredity and age can all impact the health of a man’s hair and lead to thinning or loss. 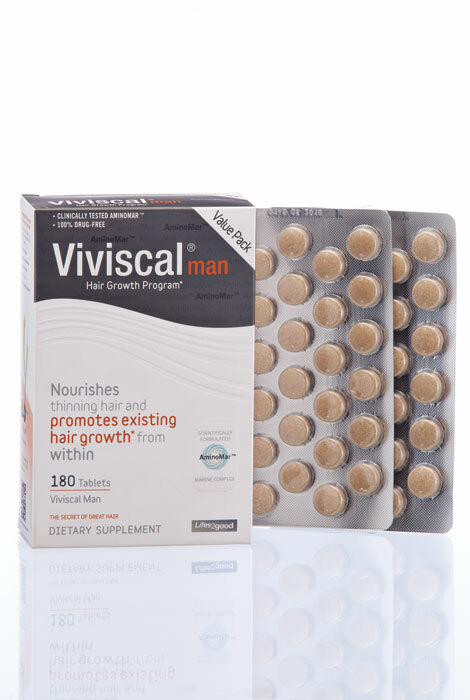 The experts at Viviscal® understand the science of hair growth and developed Viviscal® Man Hair Nutrient Tablets as a breakthrough, 100% drug-free hair supplement, scientifically formulated to nourish thinning male hair and promote existing hair growth* from within. The hair growth vitamins includes exclusive AminoMarC™ marine complex, zinc, vitamin C and horsetail extract, along with flax seed to nurture hair from the inside. This hair growth program is sugar-free and suitable for all hair types. To use, take 2 tablets daily for 3-6 months (1 in the morning and 1 in the evening), then to maintain healthy hair growth take 1-2 tablets daily as needed. Those allergic to seafood or shellfish should not use this product. Take 2 tablets daily for a minimum of 3-6 months (1 in the morning and 1 in the evening taken with water after food). Thereafter, to maintain healthy hair growth take 1-2 tablets daily as required. Viviscal® tablets are easy to swallow. Do not exceed the recommended daily intake. Can women take the same? BEST ANSWER: Thank you for your question. No, this is for men, please search for women's products. We hope this information will be of help to you.